Upper right: Image captured by NASA's Lunar Reconnaissance Orbiter showing the landing site of China's Chang'e 4 mission to the moon's far side. The photo was taken before Chang'e 4's Jan. 2 landing. Chang'e 4 took the descent photos at left and the image from the surface at lower right. Scientists have used photos captured by NASA's Lunar Reconnaissance Orbiter (LRO) to further pinpoint the landing locale of China's Chang'e 4 far-side mission. 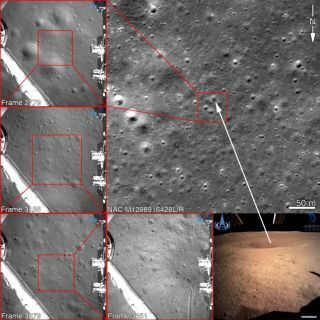 Looking at the just-released Chang'e 4 descent imagery allowed researchers to find the exact landing spot in a Narrow Angle Camera image produced by the Lunar Reconnaissance Orbiter Camera, or LROC. That image was taken prior to Chang'e 4's touchdown, explained LROC principal investigator Mark Robinson, who's based at Arizona State University in Tempe. The Chang'e 4 lander-rover duo safely set down on the plains of Von Kármán Crater on the night of Jan. 2. Soon thereafter, a color image of the mission's immediate surroundings was relayed back to Earth. Robinson said that the prominent crater, roughly 80 feet (25 meters) in diameter, in front of the lander can be seen in the LROC imagery. You can explore more of the area around the Chang'e 4 landing site via LROC's zoomify mode. Meanwhile, a senior Chinese space expert reported that China plans to deepen its lunar exploration plans, including establishing a scientific research station in the south polar region of the moon. Wu Weiren, an academician of the Chinese Academy of Engineering and chief designer of China's lunar exploration program, told China's state-run Xinhua news service that the country's current lunar program includes three phases: orbiting, landing and returning. The first two phases have been accomplished, and the next step is to launch the Chang'e 5 probe to collect roughly 4 lbs. (2 kilograms) of lunar samples and bring them back to Earth, Wu said. "We are discussing and drawing up the plan for the fourth phase of the lunar exploration program, including missions to the polar regions of the moon," Wu said, according to Xinhua. An 80-foot-wide (25 meters) crater in front of the Chang'e 4 lander can be seen in Lunar Reconnaissance Orbiter imagery, just below and to the left of the bottom arrow. The Chang'e 4 lander and rover are not in this photo; it was taken before the duo's historic Jan. 2 touchdown. Some places at the south pole of the moon receive sunlight for over 180 consecutive days. And the floors of some polar craters are never exposed to sunlight and might hold frozen water, scientists say. "We hope to build a scientific research station in the south polar region of the moon. It would be operated automatically and visited by people for short periods," Wu said. According to Xinhua, a heavy-lift carrier rocket, with a takeoff weight of about 4,400 tons (4,000 metric tons) and a diameter of 33 feet (10 m), is a goal for 2030. It would help realize the aim of bringing Mars samples back to Earth and sending Chinese astronauts to the moon.